Dubai: Tunisian wild card Malek Jaziri was hurtling towards another memorable tournament when he knocked off yet another star in the final match of the third day at the Dubai Duty Free Men’s Open, late on Wednesday. Barely 24 hours after packing off hot favourite and top seed Grigor Dimitrov for his first win over a top-10 opponent in eleven attempts, the 34-year-old Jaziri was at it again as he secured a 7-6, 7-5 win against Robin Haase of The Netherlands and become the last quarter-finalist at this tournament. Jaziri, whose best here was a quarter-final in 2014, where he lost in straight sets to Philipp Kohlschreiber, first matched and then outplayed a higher-ranked player for his second big triumph in as many days. “I owe it to all these people who came and supported me. 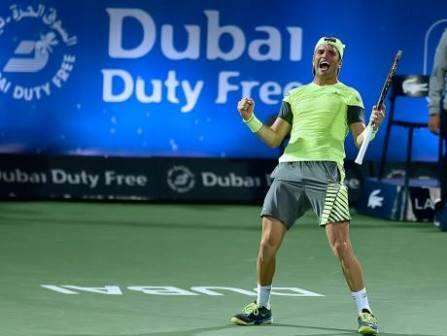 In addition, my entire family is here and this is a special moment for me as I dedicate this win to my grandmother who celebrates her 82nd birthday today,” Jaziri told a loud late-night crowd at the Dubai Duty Free Tennis Stadium. With neither giving anything away, Jaziri was less wasteful in the crucial tie-breaker as he clinched the first set and put his world No.43 opponent under pressure. The second set went pretty much the same with both having an even number of opportunities to break. And when the crucial tie-breaker did surface, it was the Tunisian who raced away to an early 3-0 lead. Haase tried a comeback but Jaziri mixed a perfect percentage game with some stunning winners to win the tie-break 7-3 after his opponent hit a forehand long. Malek will now take on 19-year-old Greek player Stefanos Tsitsipas in a battle of two wild cards to decide who will make it to Friday’s semi-finals. “No win can come easy here, and tomorrow is going to be yet another tough day against yet another strong opponent,” Jaziri said. Roberto Bautista Agut bt Pierre-Hughes Herbert 6-4, 6-7, 6-1; Borna Coric bt Benoit Paire 6-1, 6-4; Yuichi Sugita bt Jan-Lennard Struff 7-6, 6-4; Lucas Pouille bt Karen Khachanov 6-4, 3-6, 6-3; Evgeny Donskoy bt Damir Dzumhur 6-1, 6-1; Filip Krajinovic bt Marcos Baghdatis 7-6, 6-4; Stefanos Tsitsipas bt Philipp Kohlschreiber 4-6, 6-3, 6-4; Malek Jaziri bt Robin Haase 7-6, 7-5.